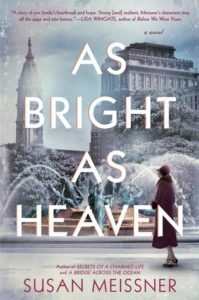 As Bright as Heaven truly impressed me as a work of historical fiction. I loved the format of the book, following three sisters and their mother in the early 1920s, the chapters cycle through each woman’s perspective. Due to this, the book also felt very pertinent as a piece of women’s literature. All of the ladies involved in this book were dealing with issues involving what society expected of them based on their gender – one very interesting aspect of this, is that they were all at different stages in their lives so you really got a feel for issues that arise during all points of a woman’s life. I was moved by this book – I found it to be an excellent examination of not just women’s lives and issues but also mortality and choices. The book focuses a lot on the choices we make, how they influence the path, or stories, of our lives. Additionally, there was a strong focus on how our choices can also have great repercussions for the lives of those around us. There were some deep and moving passages in this book; passages that gave me pause to reflect on the words and how they hold true even in my life. I loved the setting of the book and the time – the Spanish flu is not an event I have really heard much about and I love history and reading non-fiction books. This story really brings to light how devastating this flu was around the world and I am definitely interested in learning more history about this event. I would recommend this book to any of the women in my life but I also think men could really enjoy this beautifully told story – I wouldn’t want to leave them out! Well done to Ms. Meissner! Thank you so much to the publisher, Berkley Books, for providing me with a copy to review. I appreciate the opportunity to experience this gorgeous story and share my thoughts on it.